Easy to use and effective, the HotOperator Server Training Game includes everything you need to motivate your staff. Include the HotOperator Server Training Game for both front-of-the-house and back-of-the-house in your training program; use the HotOperator Server Training Game to motivate your staff and get them focused on the activities that will get you better results with happier guests, higher social media rankings and richer profits. The HotOperator Server Training Game comes with everything you need to get your entire staff motivated. The kit includes 144 cards with tips on how to be a better employee. You simply have your managers keep watch over their staff with specific behavior and activities you want your employees to perform, which are all listed on the instructions. Then, when your managers catch your staff doing the things you want them to do most, they earn one of the HotOperator Server Training Game Tip Cards. As your workers collect the cards, they can save them up and turn them in for prizes determined by you! Our recommendation is to price the HotOperator Server Training Game Tip Cards value at about 50¢ each. In this way, your staff will find enough value in the cards to want to play and learn, while not breaking the bank in the process. But don’t offer cash, turn the cash into prizes and gift cards. 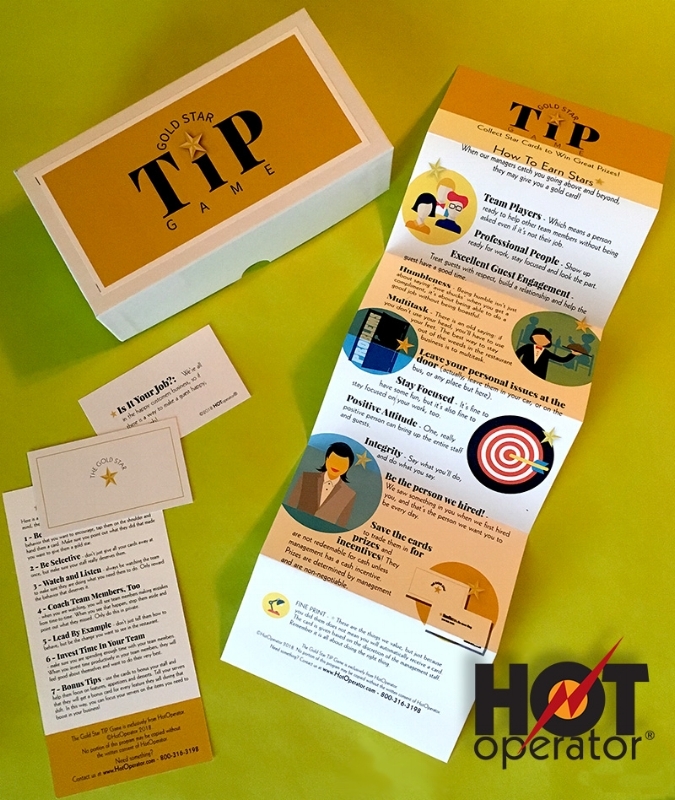 The HotOperator Server Training Game comes with 144 Tip Cards, manager instructions, and a reminder poster for your staff. The kit does not include prizes. Each HotOperator Server Training Game Tip Card has a training tip (idea, advice or pointer) that will help your staff stay focused on what’s important for working in a great restaurant. The HotOperator Server Training Game includes instructions for your management staff to help them understand what you’re looking for in your team. Your role is to introduce the game to your managers and staff, and then get your managers to focus on watching and rewarding the correct behavior in their team members. The HotOperator Server Training Game is a great way to help everyone on your team stay focused on the behavior and activities that make your restaurant a 5-Star winner! The cool thing about the HotOperator Server Training Game is everyone can play and win at their own pace. Some of your best workers will excell, and some of your workers will acquire HotOperator Server Training Game Tip Cards a little slower, but everyone will learn and grow, and everyone will win, including you! Because the HotOperator Server Training Game is so new, there is very limited availability. To get yours, please fill out this form and we’ll send you instructions on how to get signed up. Be one of the first to get the HotOperator Server Training Game and stay ahead of your competition! The HotOperator Server Training Game is priced at 29.99. Discounts are available for orders of 100 or more. Contact HotOperator for more information by filling out the form, and we’ll give you the whole scoop. Because the HotOperator Server Training Game is so new, we are looking for feedback. Please, tell us what you think! ©HotOperator Server Training Game all rights reserved. No portion of the HotOperator Server Training Game may be copied or reprinted without written consent, which will, in all likelihood not be granted.